When machine failure occurs, it’s not just incredibly costly. It can even be a matter of life or death. However, with the rise of artificial intelligence, downtime is soon to become a thing of the past. Modern society is heavily dependent on machinery. We use cars, buses and trains to commute to work. We rely on turbines and grids to power our homes. We depend on agricultural tools to farm and harvest food. In fact, it’s easy to forget how much of our lives are powered by machinery. That is, until these machines fail. Care, maintenance and upkeep are critical to a machine’s usefulness. But it’s often a tricky balancing act of deciding when or if to repair or replace parts. And as with most decisions made on guesswork, huge inefficiencies can follow. It’s no surprise many organisations are looking at how AI and machine learning can drive insight and reduce inefficiencies and failure. When it comes to productivity, downtime is its antithesis. This is because it only takes one machine to be out of action for an entire supply chain to grind to a halt. Of course, many businesses expect and accept a small amount of downtime. They understand that machines need to be periodically taken offline to be inspected for safety and repairs. But while businesses can work around this planned downtime to ensure their operations remain as active as they can be – unplanned downtime can be hugely disruptive. Unexpected outages and failures in equipment can cost an organisation significant amounts of time and money. This is because it prevents employees from doing their job, stalls production timelines and, depending on the industry, can cause huge amounts of lost customer trust. For instance, just imagine the disaster that would ensue if a hospital medical device were to fail. Maintenance is scheduled, regardless of condition. Parts are replaced based on past experiences in anticipation of future failure. The decision is often time based and statistically derived. Reactive maintenance (i.e. unplanned downtime) is a run-to-failure approach. It can be highly disruptive as businesses must cease operations when machines fail without warning. However, this passive approach keeps routine maintenance costs low. Technician staff are only required as and when needed. Planned maintenance reduces the risk of failure with periodic assessments. While the risk of failure is still there, businesses have a greater chance of pre-emptively fixing the problem before it becomes extensive. But while this may maximise the useful life of a machine, it can also result in significant lost production time while the machine is out of service. Proactive maintenance aims to make maintenance more efficient. It does so by using analytics to understand the capacity of machines, to identify its critical moments and to optimise maintenance resources. It’s less about adhering to a schedule and more about using data to review and enhance operations. For companies responsible for a large fleet of machines, proactive maintenance seems the most cost-effective strategy for both long-term and short-term thinking. However, this approach is limited in that it only looks to control the factors that can lead to machine failure, rather than examining the machine itself. So, what to do? Fortunately, better connectivity and exciting tech innovations are helping to fill the gaps. AI expected to eliminate 1.8 million jobs by 2020. But it’s also expected to create 2.3 million jobs over that same period. To begin with, healthcare, the public sector and education will see continuously growing job demand. Manufacturing will be hit the hardest. Today, many tech giants are focusing their energy on AI development. The likes of Microsoft, Google, Amazon, IBM, Facebook and Apple, as well as thousands of AI startups, are all competing against each other to take the lead on AI. According to the market research firm Tractica, the global AI market was worth €1.99 billion in 2017 and is expected to be worth €30 billion by 2025. Its growth will be substantial because of its ability to be applied to all industries and use cases – maintenance included. This is because, regardless of what AI scientists are creating, they all share a common purpose. That is, to eliminate repetitive tasks and help humans become more efficient and effective at whatever it is they want to do. Improved maintenance is a part of this. With AI, maintenance can evolve from being merely preventive or proactive to being predictive. Many industries that are heavily dependent on asset machinery are investing in predictive maintenance. This is because with the capabilities of AI, maintenance can evolve from being merely preventive or proactive. Instead, it can become predictive. With predictive maintenance, repairs only happen when necessary. This is achieved through connected sensors, switches and AI-enabled tools that can analyse the thousands of variables at play in a machine to find insights that would otherwise go undetected. Data from various sources can be collected, combined and analysed in real time so that businesses can anticipate faults in their machinery before they happen. When data shows performance is declining, operators can choose to send in repairs before the whole assembly line comes to a halt. This ability to foresee repairs will substantially help reduce and control maintenance costs. Yet it can also have wider business benefits. For example, if predictive maintenance suspects failure is imminent, a number of things can be automated to happen depending on what the problem is – send for a work order, notify relevant technicians, or order a replacement part, for instance. Over time, the predictive maintenance can identify how to best go about fixing repairs. This secondary layer of analytics will give businesses further insight into how to boost efficiency and eventually lead towards zero downtime. This is because AI can determine what the true lifespan of the equipment is, what the best time to undergo repair is, and how to plan operations to minimise the repair window. Furthermore, with the data gathered from predictive maintenance, a manager can have a better idea of why different teams using the same machinery are resulting in varied returns. Again, this additional data can give businesses the insight they need to figure out how to bring in additional revenue. It can help with project planning, staffing needs, inventory management and customer service. Decisions are backed by evidence – and therefore made with less risk and more confidence. 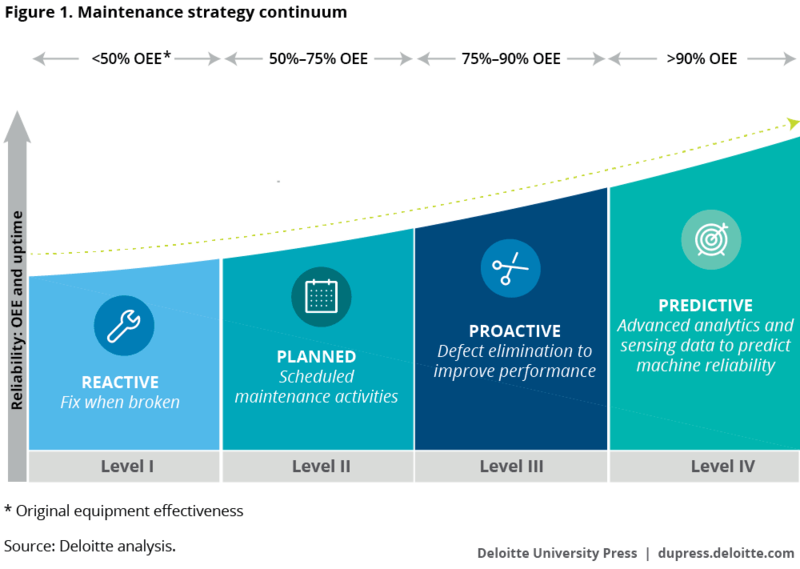 Predictive maintenance is key to manufacturing innovation as it allows organisations to optimise their entire maintenance strategy from the top down. While this presents an exciting future for the sector, the good news is that it is already being embraced. Many industries are already using some form of predictive maintenance today through continuous monitoring technologies. Internet-of-Things-enabled tools are helping organisations keep an eye on system performance and operational environment. Yet continuous monitoring can generate huge amounts of data – which is why AI must come into the mix. With advanced algorithms and machine learning, businesses will be to use real-time insights in the decision making. In Germany, Deutsche Bahn is working with Siemens to improve its preventative maintenance technologies. By using smart sensors and algorithms, the train operator hopes advanced data analytics can recognise patterns in operating data. For example, intelligent braking systems can be monitored for optimal replacement time. Sensors can monitor the state of the track to deal with repairs. By decreasing the fault rate of train parts, Deutsche Bahn can reduce the need for spare parts and cut down on downtime. Recalls aren’t only expensive for manufacturers – they’re also highly dangerous for consumers. Fortunately, data and AI can prevent this by discovering issues a lot sooner. BMW is working with Teradata to enhance their decision-making by using the huge amounts of data generated across automotive design, production and distribution. By combing this data and running it through powerful analytics, car companies can create efficiencies in their supply chains and better highlight errors before they cause problems. Maintenance on aeroplanes is often highly complex, which is why scientists are developing tiny robots that can enter the inside of an engine to inspect its parts and carry out repairs. As reported in The Economist, it’s a project that’s being developed by a team of scientists at GE Global Research. For now, these robots are being programmed to conduct inspections. But once this stage is perfected, the scientists hope the robots will be able make repairs and work while a plane is waiting at the gates between flights. Robots designed for heavy lifting are already being used today. But tomorrow’s warehousing robots are expected to help humans as well. SecondHands is a robot designed to assist human maintenance technicians. It’s being developed by Ocado Technology in collaboration with Karlsruhe Institute of Technology, and is designed to make human-led maintenance more efficient. For example, the robot can proactively hand the humans certain tools when it detects an action is needed. The robot uses visual scene perception, human action recognition, task planning and execution, among other skills, to achieve this. Predictive maintenance lends itself well to large companies responsible for a large number of machines. This is because sufficient data is needed for patterns to be identified and problems to be solved. However, once large firms have the ability make these predictive decisions, this knowledge can be licensed down to smaller companies. As such, AI can benefit all. Looking further ahead, it’s expected the next step for maintenance will be machines relying entirely on self-maintenance. This can be achieved through combining technology such as 3D printing with AI capabilities. Once this happens, there will be very little need for human interaction at all. For now, knowing the true impact that unplanned downtime can have on an organisation will help businesses better understand where investments should be made – because the benefits of greater capacity and lower overheads are substantial. Those who prepare themselves today will be more likely to maintain their competitive advantage tomorrow.